I have several things going on in April. The first is that I am running a fundraiser for ChildSafe Colorado. I am donating 20% of all sales I have on my Close To My Heart shop in April to ChildSafe Colorado as part of my participation in Shimmy Mob 2015. You can access my Close To My Heart shop via the link on the right hand side of my blog. ChildSafe Colorado is an awesome charity that the Ft. Collins Shimmy Mob team is supporting for the 2nd year in a row. They provide services for children who have been victims of sexual abuse and their non-offending family members. It's an amazing charity - check them out here: http://www.childsafecolorado.org Let's help them make thrivers of the survivors! Also in April Close To My Heart is running a really fun special. 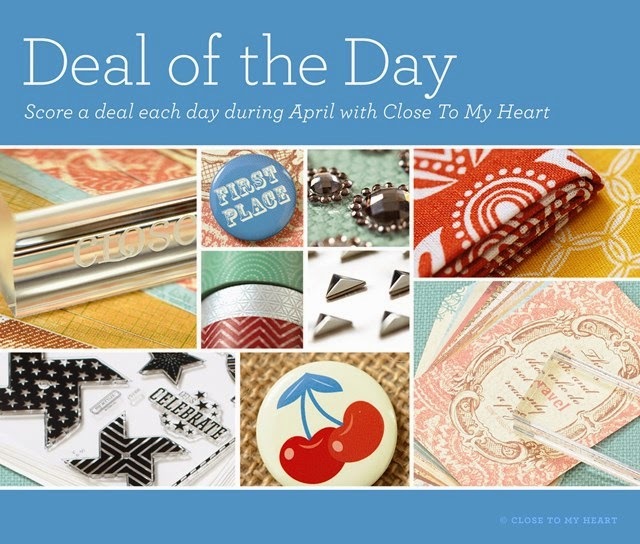 Each day during April, while supplies last, they will have a random grab bag filled with current and retired Close To My Heart products available for purchase at a major discount. To grab your bag, simply place any current, full-priced item in your online shopping cart at my website and you will be eligible to purchase as many grab bags as you wish (while supplies last)! Grab bags will be featured at five different price points throughout the month, ranging from $35 to $150. Some grab bags will contain product with more than DOUBLE the retail value of the price you pay! Grab bags will be available for 24 hours starting at 3 pm MDT each day and only while supplies last—so visit often and early! Remember that grab bag tiers will be featured on a random schedule throughout the month, so seize the opportunity to purchase from the grab bag tier you’re interested in when it becomes available because it might not come around again! I'm also really excited about the Stamp of the Month for April. This has to be my favorite one so far! I'll be posting a project I made on my blog tomorrow so come back and check it out then. You have two ways of purchasing the Stamp of the Month. You can pay the full price of $17.95 for the stamp set or you can get it for only $5 if you have a qualifying purchase of $50 or more. And...the grab bag purchase counts toward the $50 purchase! Please let me know if there are any questions you have about any of these exciting things I've shared!